Dont see "Check Prices & Book" button after inserting dates? or contact Ottavia directly from "Contact me". The apartment Milan is on 2nd floor with elevator. Entering you find the kitchen with table, chairs and a modern design white leather sofa double bed, you can use this room as living room too. The other room is the bedroom with a double bed, a desk and a design armchair, library, wardrobe and TV. Bathroom with shower. Quiet, central located, in a safe residential area, close to the main public transports and universities. 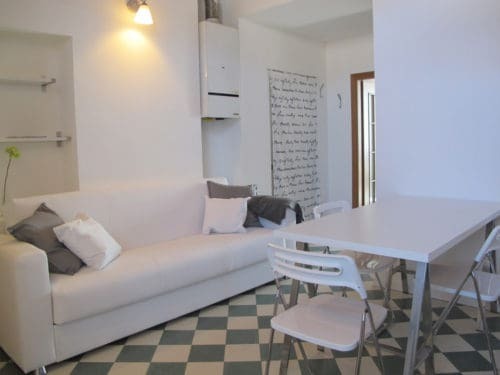 The apartment is located in the most famous and typical alley in Milan. Along the Navigli (canals), the best Italian restaurants, the most particular shops, art galleries, bars for “aperitivo”. Walking distance from Porta Genova metro/train station, close to all the main public transports. Every kind of shops and service nearby. Bocconi, NABA and Domus are very close. Click the symbol on the right for fullscreen view and “esc” button to exit. Move the image dragging the mouse and click on the hotspots to see the other rooms. a detailed reply with options and prices.